nancye's art and beautiful junk: Get to go on a field trip today. Get to go on a field trip today. Today is Tuesday and one more day before school lets out. Today I will be going with about 90 1st graders to the art institute in Mpls. How fun should that be? One more day to get up early and get little people ready for school and then SUMMER! Yeah!!! 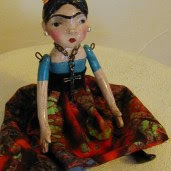 Look to the left and see a sneak peak of my new addition to the handmade dolls. She is a candle stick doll. I call her that because...well, I'll tell you later when I get her finished. She will go on Ebay tonight, then I will show you the whole thing. Gotta run now and get on the bus for the field trip. Make it a fun day!